Your outer world will always match your inner world. Knowing how visualization works helps in visualizing better. Applying a technique mindlessly may not yield the desired results. Here is the best explanation of the how. The mind is made up of two parts, the conscious mind and the subconscious mind. We think with our conscious or rational mind and whatever we think repeatedly sinks into our subconscious or creative mind. The subconscious mind is like a computer. It cannot think on its own, it cannot distinguish between good and bad, between true and false. It takes on face value, whatever is presented to it. When the conscious mind presents the subconscious mind with the same thought again and again, it starts taking the thought seriously and sets about bringing it into existence. Our lifetime of experiences are stored in the subconscious mind to which it has access. It also has access to the Universal mind for which nothing is impossible. The subconscious mind then brings about circumstances in which our repetitive thought is manifested. A man had a daughter who had severe arthritis. He tried many medicines but without result. Whenever he used to meet someone, he used to say, "I'll give my right hand to get my daughter cured." Of course he made the remark figuratively but he made it over and over again. Strangely, two years later, when he was travelling in a car, he met with an accident in which his right arm was torn apart from his body. Within a few days, his daughter's arthritis got cured! In order to know how visualization works, we have to understand that the pre-eminent language of the subconscious mind is pictures. Though it understands words equally well, it is more easily influenced by pictures. That is why visualization is so effective in making your subconscious mind deliver to you whatever it is that you want. 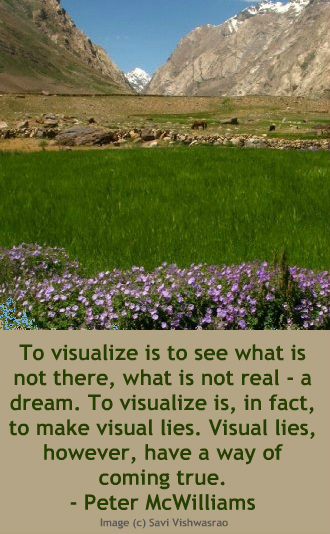 To visualize is to see what is not there, what is not real - a dream. To visualize is, in fact, to make visual lies. Visual lies, however, have a way of coming true. It is also important to visualize only the end result and not the process. We have to tell the subconscious mind only what we want. Leave it to the subconscious mind to decide the process of getting it. Follow the rules given below to visualize effectively. It is absolutely essential that you convey your exact desires to the subconscious mind. If you want to get the car repaired and you tell the mechanic how much you paid for the car and how fast it goes instead of telling him the exact problem, your car is not going to get fixed. If you want to manifest some money, decide on the exact amount, and the time in which you want it. For example, $25,000 by Christmas this year. Now start visualizing that you are receiving this amount, in various ways. You can visualize getting a cheque for this amount by post or you can 'see' an entry for this amount in your bank passbook for this amount ao receing this amount in cash, all by Christmas of this year. The subconscious mind is only interested in the goal you want to establish. You don't have to figure out how the engine works and how much torque it produces to get the car fixed. The mechanic (your subconscious mind) will take care of that. You only have to picture the end result in your mind. All the inbetween steps needed to realize the goal will be taken care of, whether you want an increase in salary or a new house or better health. Create images that are as clear and accurate as you can. Put yourself in the picture. For example, if you want a car just like the one that your friend has, and if you visualize your friend driving that car, then you may never have a car like that. You have to visualize yourself driving that car! Your subconscious brings forth exactly what is shown to it on a regular basis. If you want a new and better job and you picture a new office regularly, then probably your present office may be shifted to a new place like the one you saw in your mind, but you may not necessarily get a new job! This is how visualization works. When you paint mental pictures, add bright and beautiful colors. The subconscious cannot differentiate between a real scene and an imagined scene. The more realistic pictures you create, the more impressed your subconscious becomes. When you consciously erase the mental image of being overweight and create a new image of you at your ideal weight, your subconscious will support the new image and will strive to bring it into reality. In knowing how visualization works, it is important to realise that for the subconscious mind, everything happens in the present. The conscious mind may label an event as having happened two years ago or to happen two years hence, but to your subconscious mind it is all happening now. The subconscious mind cannot differentiate between good and bad. It is our conscious mind that does the differentiation. For example, your subconscious mind does not think you are either a good or a bad person if you are overweight. It simply observes the image and supports it by influencing you to overeat (and do no physical activity!) in order to maintain a physical image that is consistent with the mental image it holds. This is a critical point in understanding how visualization works. So How Does Visualization Work? When you visualize how you want a particular aspect of your life to look in the future through bright, colorful and vivid pictures, like a new car, a new house, a new job or business, exotic travel, etc. your subconscious mind receives that information as happening right now. It also records the mental pictures as real and valid. 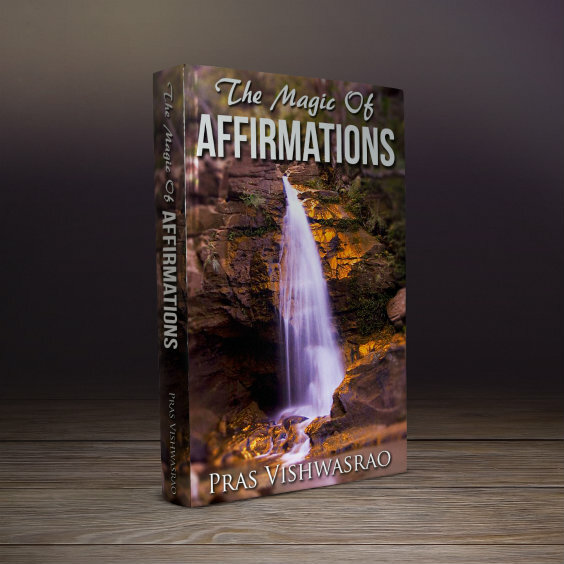 And because the subconscious mind supports the images in its database, and wants the mental and physical images to be consistent, it will try and match your outer reality with the new mental reality, thus realising your goals and manifesting your desires. This is how visualization works!